Grand Place, Brussels comprises a central square and harmonious ensemble of surrounding buildings that represent the culture of this mercantile city from the late 17th century. The square is 110 x 70 m, and is in use as a marketplace since the 15th century. It is now surrounded with buildings dating from the late 17th century. Most of them used to be guild-halls. Their facades are decorated with statues, symbols and the name of the house. The City Hall is the most remarkable of them, and is still used for marriages. At the Square, the Broodhuis shows various costumes from all over the world that the famous little man Manneken Pis received as presents. Him dressing like Sherlock Holmes is my personal favorite. The city is so close (a 2 hour train ride from my home), but also so different. Brussels around the Grand Place looks medieval. But there are also shopping streets that resemble those in the average Dutch town. And a lot of Japanese, American and other tourists. I did return in 2006 to take some beter photos. But that's not easy: the market square is smaller than I remembered. The international crowd of tourists still visits Brussels, now made up of Chinese and Russians. In many ways, Grand Place in Brussels looks the same as it did in the 17th century. There’s a Starbucks now and a couple of chocolate shops and outdoor cafés, but the stunning architecture of the square’s old buildings dominates everything and makes the modern additions fade into the background. Even though I’ve seen dozens of magnificent squares in Europe, this one made me stop and catch my breath. Between the gilded facades and the soaring bell tower of the City Hall, I could not figure out where to look first. On one side of the square, the City Hall is the focal point not just of the square but really of the center of Brussels—at 315 feet it can be seen from around the city. The tower is topped with an enormous statue of the archangel Michael slaying a devil. It’s been much the same since its completion in 1454. Facing the City Hall, the Gothic-style King’s House now houses the City Museum. The sides of the square are lined with beautiful Baroque merchant houses, many with ornate rooftops and golden decorations. One of the interesting things about Grand Place is that it doesn’t have a church, which is relatively uncommon for old squares. That missing piece emphasizes Grand Place’s initial purpose as truly a market and business-oriented square. It is possible to visit the City Museum. Although the exhibits are a little bit dry, it does give a good sense of the history of the city and the square. You can also visit City Hall, but only on a guided tour. All can be quite crowded during the summer. Despite the activity, this is still one of my favorite areas in Brussels to stay. 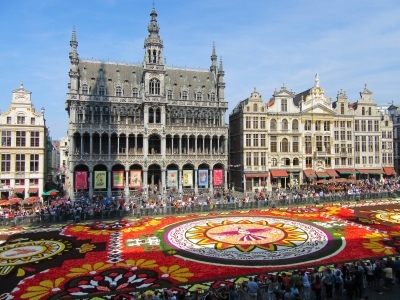 Every two years in the summer, Grand Place is temporarily filled with a giant themed flower carpet, which is remarkable to see, especially from above. 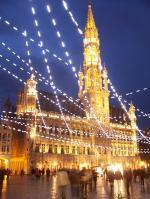 In the winter, it houses one of Brussels’ many Christmas markets. If you’re not feeling in the Christmas spirit, a visit here will surely change that. It seems that Belgium is often overlooked in Western Europe, but I would recommend a visit to Brussels and the Grand Place. Read more from Travel Addicts here. 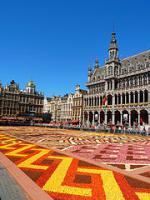 For four to five days in August, every two years, the most scenic square in Brussels is adorned with a floral carpet. When I decided to visit World War I sites in Belgium this past summer, I opted to time my trip to coincide with this exhibit in the Grand Place of Brussels. This year, on the 20th anniversary of the Grand Place becoming a World Heritage Site, Brussels chose to display a carpet celebrating the culture of Guanajuato, Mexico (yet another World Heritage Site). On the Tuesday night prior to the display, the square had been blocked off, patterns had been traced out in the square, and some boxes of flowers were beginning to arrive. I was amazed at how quickly the carpet had been assembled when I walked by the square again on Wednesday morning. I met up with friends on Wednesday afternoon, and we purchased tickets to view the carpet from the second floor of the impressive Town Hall. From the balcony we had an awesome view of the floral display, as well as of the numerous guildhouses enclosing the square. The Mexican theme of the carpet continued at night, with a lively sound and light display celebrating Mexican culture. Although I was less impressed with the remainder of Brussels as a city, the Grand Place of Brussels was definitely worth the visit. 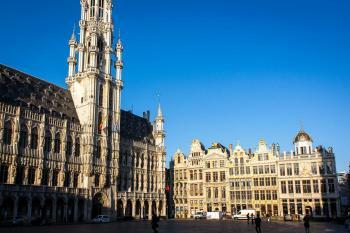 Logistics: The Grand Place of Brussels is within easy walking distance of the Brussels Centraal railway station. The Grand Place is one of the most important sites in Brussels and almost every visitor and tour comes through at some point during the day. I get there at about 9 o’clock in the morning and I almost have the place to myself. But the crowd grows steadily and by 10 o’clock there are a lot of tour groups standing around, getting in the way of my photos. The square also doesn’t look too different from the 16th century. Sure, there’s a Starbucks in the lower level of one of the old guild buildings, but the overall architecture hasn’t changed. You can see the designs on the walls that would project out the power of the establishments to the traders in the square. 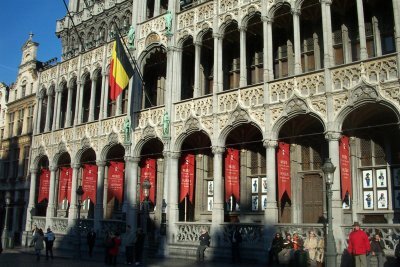 The Duke’s building is now the Museum of the City of Brussels and has interesting exhibitions inside about the history and geography of the city. I don’t think it’s the most exciting place but it does give you the opportunity to see the inside the building and learn some interesting facts about Brussels. The most important site at the Grand Place is still the Town Hall and it’s impossible to miss it. It’s is almost 100 metres tall and has a cool 5 metre statue at top of Saint Michael killing a demon. You can’t just wander in and have a look yourself unfortunately, but there are guided tours each day in different languages. It’s worth doing – but we warned that they can be popular in the summer tourist months. I visited Brussels first in March 2009 and once again in November 2013. The Grand Place is really amazing due its closed architectural integrance. However leaving to the side streets, the situation looks different. Not too many people which makes a pleasant stay also on the Place. Since I have been living in Brussels for the past 4 years, I tend to forget that I have such a beautiful WHS close to my doorstep. Perhaps because it is always packed with tourists and noisy groups. However, it is the heart of the city and a true spectacle when it is embellished with the flower carpet for a few days in Summer (every 2 years). A must-see. The Grand Place of Brussels is an astonishing artwork. Considered by many, whose myself, as one of the most beautiful squares of the world, it is composed by many guild's and merchant's houses, the city hall and the King's house. The city hall was build during the first half of the 15th century. This site testifies of the wealth of the merchants and of the guilds in Northern Europe during centuries. I visited this site in June 2011 and found the place magnificent. I love the Grand Place in Brussels! It is so beautiful with its cobblestone streets, ancient cathedrals, flowered lamposts, quaint shops and restaurants. The Belgian waffles you get on the street for 1 EURO are the best in the world! It is easy to naviagate and find your way around all the streets. The people are friendly and almost all the shops speak English. If you go to Brussels, I urge you to visit the Grand Place; you will love very minute of it....just make sure you bring your camera as it's a great place to take photographs! I didn't spend too much time in Brussels. 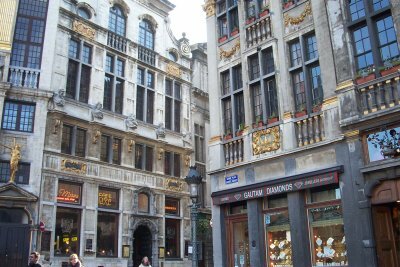 Nevertheless, the most enjoyable momment of my brief stay was when I found myself sitting at a coffee shop, enjoying the incredible view of the medieval buildings surrounding the Grand Place. The paved square and the buildings around it, which, as far as i was told, used to be trade unions and Chambers of Commerce, created a wonderful atmosphere, while modern street artists were demonstrating their vocal or performing skills, and tourists and local people circled them to watch or be a part in their shows. The old Town Hall, with its gothic tower, is trully memorable, as you can feel the splendour and the charm of the days of the Renaissance by just staring at it or by touching its walls. The best time of the day to visit Grand Place is late in the afternoon. You can enjoy a warm tea at the picturesque coffee shops on the square, walk on the paved streets around the square, or you can look for the small statue of the Manneke Pis, a rather overrated bronze fountain sculpture depicting a naked little boy urinating into the fountain's basin. 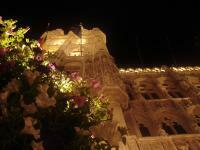 You shouldn't miss a feast that is held on the Grand Place late in the evening. Strong coloured beams of lights point at the facade of the Town Hall, creating wonderful shapes and figures by colours, while adaptations of classical pieces of music are heard from loudspeakers placed opposite the building. The combination of music and lights on the town hall walls create a marvelous and unforgettable experience, that I can recall before my eyes just right now, while writing these very lines. However, should you want to experience this feast, you have to find out when exactly it is held beforehand. A wonderful and relaxing visit, that will help you recharge your batteries after a tiring day-walk around the city sightseeing. I visited the Grand Place, Brussels in August this year. The square is superb. It takes you right back to a few centuries ago. The cobbled streets, the pretty lamp posts with flowers on them, the awesome buildings and the pretty little streets that lead away from the square are amazing to say the least. Not far from the mannequin pis is a little shop that sells the best waffles ever. I can still smell the waffles when I close my eyes and also clearly recall the taste of the fresh honey-dripping waffle I ate!!! My visit to the Grande Place was wonderful. I went in search of it, but was still struck by the majesty of it when I got there. I ended up going back each afternoon of my visit, to stroll through and eat in the open air cafes. This spot truly feels like a crossroads of countries, people and centuries. The buildings are majestic! People ask me, what is there in brussels?I have stayed there twice. First time for one night, and two nights the second time.There is more to Brussels than the Grand Place,but it is a place everyone should see if only the once.You really don,t know what to expect until you literaly stumble upon it and you are not dissapointed. Such a wonderful place and even if it rains as it did my on my last visit it is still an enjoyment to soak in the atmosphere. If you have an opportunity to go there, do it. It is the most beautiful square I have seen and I will be going back again. I just got back from Europe. I visited Brussels and was certainly not impressed by the city until....I too turned the corner from one of the little alleys and found my self almost crying from the emotion. It was amazing all lit up at night. I was transported to 300+ years ago and wondered how such a magical place could have survived this long. Unfortunately I couldn't see it during the day as my tour left early the next morning but I will definitely return. Probably one of the smallest WH sites, but when you're in Brussels, you will get there anyway, and it is a very impressive place. Not really as big as the name would imply, the Grote Markt /Grand-Place, to be linguistically correct in the Belgian way, this collection of medieval/ Renaissance houses, especially the City Hall, is still outstanding, especially when you can enjoy great Belgian food and drinks in one of the little alleys nearby. Eating mussels and fries and watching the guild houses lit up at night cannot be easily beaten in terms of joie de vivre. I have many memories of the Grand Place in Brussels. Most revolve around the summer tours with my collegiate a cappella group during which we always found ourselves in Brussels and performing, with cap in hand, for the benefit of tourists and locals alike, hoping to scrounge enough cash to fund the night's consumption of fine Belgian beer. As such, the Grand Place was a perfect venue, with a lovely architectural setting and a lively atmosphere, scented by the aroma of waffles and "French" fries. If you find yourself in Brussels, you will inevitably gravitate here, and, remember, always toss a few coins in the direction of the group of college guys crooning doo-wop tunes for the crowds. As a square, there are few more beautiful examples in the world. La Grande Place/Grotemark is hemmed in by exceptionally attractive buildings, the highlight of which is the Hotel de Ville. It is a very impressive piece of secular gothic architecture, though perhaps not as good as its companion in Leuven 30 minutes away. However the streets that run off from the main square are quite tacky, which always leaves me feeling slightly under whelmed by the whole experience of visiting central Brussels. The area is home to lots of cheap souvenir & chocolate shops and of course the Manneken Pis statue. It is just a short walk from Brussels Centraal station, which has to rank as one of Europe's most depressing travel interchanges. Brussels is certainly an interesting place and the Art Nouveau heritage the city has to offer is almost unparalleled. However it has never really grabbed me and has always felt less than the sum of its parts. That said la Grande Place is an exceptional delight in its very core. The Grand Place is absolutely stunning. It's one of the most beautiful architectural gems I have every seen in Europe. It is spectacular both in the morning and in the evening when moat of the building on the square are lit up. Truly not to be missed!! I just got back from Brussels yesterday. The Grand Place is absolutely stunning. I found my way there via metro (1.40 euro each way) and followed the green directional signs through the downtown, and through a few cobbled alleys. As you turn your last corner and wonder if you are going the right way you run into it, and it hits you hard! Amazing, just amazing, the sheer size of the buildings and the incredible artwork. The stone somehow looks like lace! It is remarkably clean in the center of all the buildings, so clean in fact that people of all ages laid on the ground to see everything as the towers were so tall. I ate dinner there outside just so I could have more time to take everything in. You can't just leave easily. I walked away and found myself rounding that one corner again to try and double the effect of seeing it for the first time. 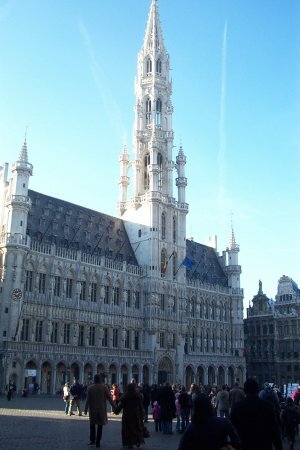 On my official trip to Brussels from the USA in Oct 2002 I was booked in a hotel in the Grand Place area. I just decided to stroll and I couldn't believe what I was seeing when I entered the Grand Place square. It was late in the evening and the square and the guild houses were lit. The effect it had was magical! The critical mass of the Italian Baroque blend of architecture completely transformed me. It was as if I did a time travel to earlier centuries. All this experience is free! I highly recommend this place especially when it is lit! 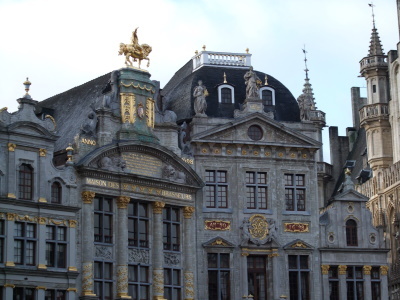 The disappointing thing is that I tried to find the explanation and the architectural details of each guild house in the Grand Place on the internet in English and couldn't find any. Destroyed during invasion: "On August 13, 1695, a 70,000-strong French army under Marshal Fran?ois de Neufville, Duke of Villeroy began a bombardment of Brussels in an effort to draw the League of Augsburg's forces away from their siege on French-held Namur in what is now southern Belgium. The French launched a massive bombardment of the mostly defenseless city centre with cannons and mortars, setting it on fire and flattening the majority of the Grand Place and the surrounding city. Only the stone shell of the town hall and a few fragments of other buildings remained standing. That the town hall survived at all is ironic, as it was the principal target of the artillery fire." Tintin: "Les aventures de Tintin, reporter du "Petit Vingtième", au pays des Soviets" He returns to a "tremendous reception in the Grand place"
645 Community Members have visited.